In September 1940 four young Australians, John Shannon, Ian Startup, George Hall and David Hall (not related) joined the Royal Australian Naval Volunteer Reserve (RANVR). They were among a larger group of men from around the continent who answered the call of a recruiting initiative known as the Dominion Yachtsmen Scheme. This scheme was introduced following an appeal to the dominions from the British Admiralty in June 1940 to surge 'gentlemen' with yachting experience into service with the Royal Navy (RN). At that time the war at sea in the northern hemisphere was being hotly contested between the RN and the German Kriegsmarine and men with any amount of sea-going experience were in high demand. Two streams of entry were available within the yachtsmen scheme. 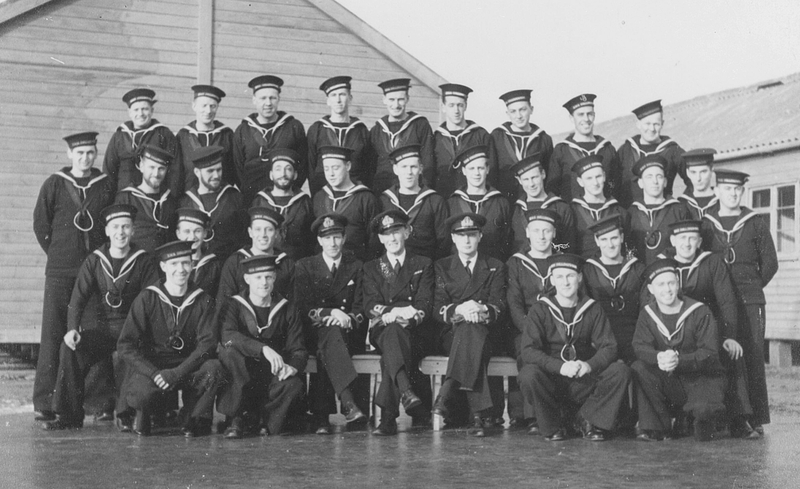 The first, stream ‘A’, catered for men aged between 30 and 40 years who possessed mariner skills and who met the navy’s physical fitness standards for officers of the executive branch. The second, stream ‘B’ was introduced for yachtsmen aged between 20 and 30 years who were considered to have the academic qualities required for advancement to commissioned rank and who might be promoted following a period of training and sea service as ordinary seamen. It was in stream ‘B’ that Shannon, Startup and the two Halls signed up, and within days of their enlistment they found themselves taking passage to England in the liner Strathnaver. RANVR 'Yachtsmen' taking passage to England in the Strathnaver. Image courtesy of Geoffrey Thomas. Unbeknown to them, they were destined to make the ultimate sacrifice in one of the best known naval battles of World War II. Arriving in England in October 1940 the four recruits joined hundreds of RN ‘Hostilities Only’ ratings undertaking basic training at HMS Collingwood situated in Fareham near Portsmouth. The training consisted largely of instruction in seamanship accompanied by the usual ‘square bashing’ that is synonymous with service life. 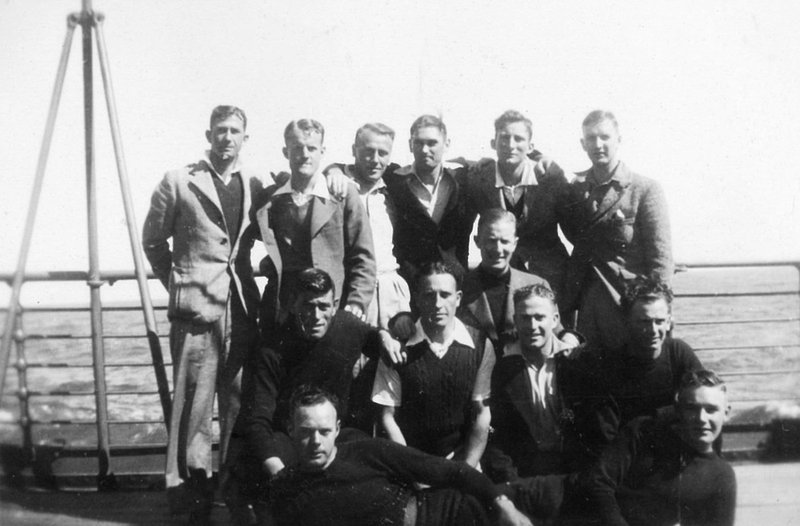 Wartime conditions at Collingwood were austere but from all accounts the Australian yachtsmen took to their training with a will and integrated well with their RN counterparts. 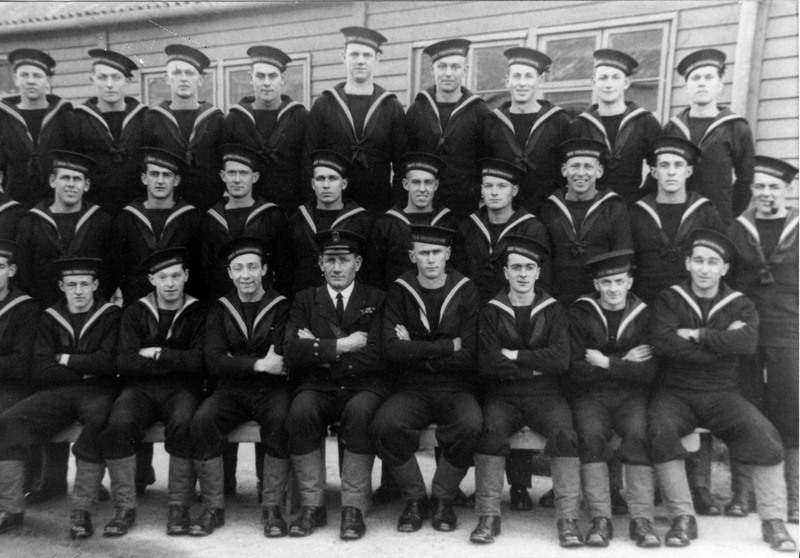 Ordinary Seaman John Shannon (Far left, top row) with fellow class members, HMS Collingwood Dec 1940. Image courtesy of Geoffrey Thomas. On 23 January 1941, the four Australians were drafted to the battlecruiser HMS Hood for consolidation training. At that time, Hood was arguably the most famous warship in the world. Displacing almost 45,000 tons and equipped with a main armament of eight 15-inch guns she had been the symbol of British sea power since her commissioning in 1920. Hood had visited Australia as the flagship of the RN’s Special Service Squadron (SSS) when it travelled around the globe on an epic 38,000 mile good will cruise lasting ten months during 1923-24. The six ship squadron visited almost every major Australian port where its 4,600 officers and men were warmly received by tens of thousands of well wishers. Hood was without doubt the centrepiece of the SSS and the visit firmly cemented a place for her in the hearts and minds of an adoring Australian public. Naturally the prestige associated with joining such a famous warship was an exciting realisation for the four yachtsmen, reporting for duty in Rosyth, where Hood was undergoing urgent mechanical repairs. 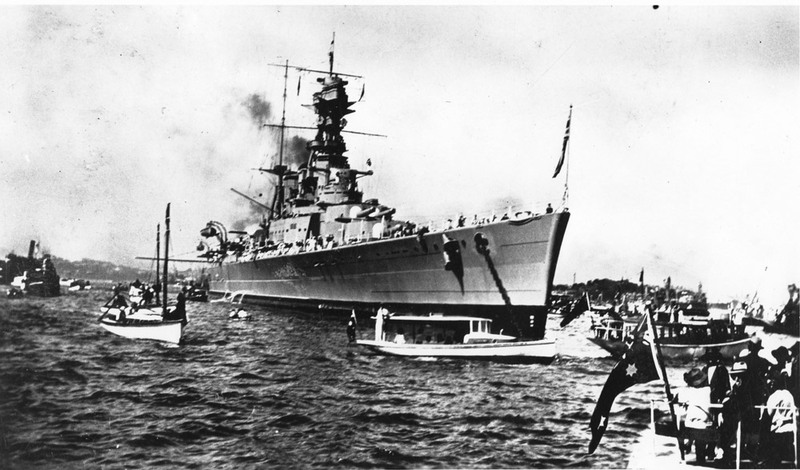 HMS Hood anchored in Sydney Harbour, 9 April 1924. Hood’s refit lasted two months and during this period both King George VI and Britain’s Prime Minister, Winston Churchill, visited the battle-cruiser and addressed her ship’s company. Again the esteem in which the ship was held was reinforced when Churchill commented that he hoped that ‘after her insides had been put right they would continue to uphold the traditions and maintain the reputation of the famous ship’. On 17 March 1941 Hood threw off the shackles of the Rosyth dockyard, ammunitioned and sailed into the North Sea. There she joined the battleship HMS Queen Elizabeth and the cruiser HMS London on a blocking mission to intercept the German battleships Scharnhorst and Gneisenau. The enemy ships were attempting to return to port following a successful two month operation during which they had sunk 22 allied ships totalling 115,622 tons. Frustratingly for the British, the raiders skilfully evaded contact and successfully made their way to the relative safety of the German occupied French port of Brest. Following this sortie Hood returned briefly to Scapa Flow before proceeding on her next patrol. By then the four Australian yachtsmen would no doubt have found their sea legs and settled down into the familiar pattern of watch keeping, coupled with the daily routine of closing up at dawn and dusk action stations. This patrol work continued into April when intelligence was received concerning a possible breakout into the North Atlantic by Germany’s newest and biggest battleship Bismarck. 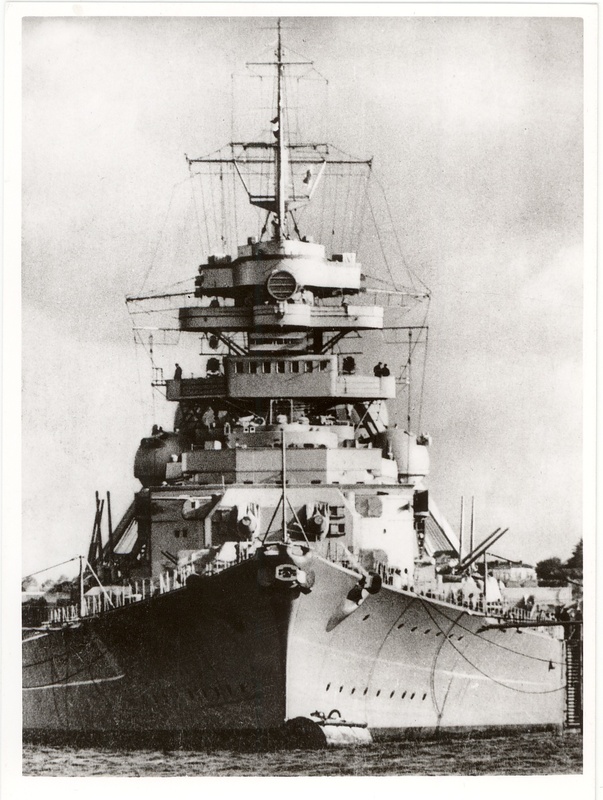 Germany's most modern and powerful battleship, Bismarck. Commissioned in August 1940, Bismarck was considered by many to be the last word in German battleship design. Displacing 50,000 tons at full load, she was armed with a main battery of eight 15-inch guns and a secondary armament of twelve 5.9-inch guns. On 18 May 1941 Bismarck sailed under the flag of Admiral Gunther Lütjens from Gotenhafen (Gdynia) in company with the heavy cruiser Prinz Eugen. Designated Operation RHEINÜBUNG, their mission was to attack allied convoys, and disrupt British sea lines of communication. Within days of sailing, the German force was detected at anchor in Kors Fjord near Bergen on the west coast of Norway. 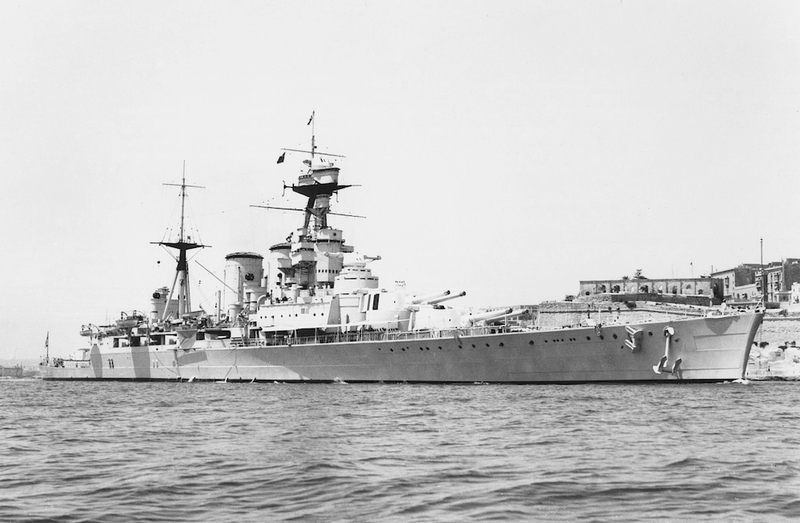 Consequently Hood and the newly constructed battleship Prince of Wales sailed from Scapa Flow with orders to proceed to Iceland to cover a possible breakout through the northern approaches. Meanwhile other units of the British Home Fleet were dispersed to cover areas further south. The British did not know that the German ships had already sailed and were steering a course that would take them to the north of Iceland and through the Denmark Strait. Onboard Hood her crew prepared for the onset of cold weather and went about their normal duties. There had been many alerts in the preceding weeks and it was felt by some that even if the current situation resulted in action the Hood was more than capable of handling any ‘jumped-up German pocket battleship’. 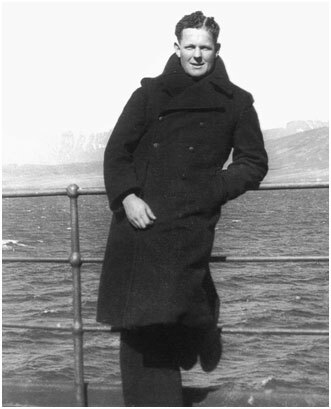 On 22 May, orders were received for Hood, Prince of Wales and their attendant destroyers to cover the area to the south west of Iceland in anticipation of a German transit through the Denmark Strait. The following day the British cruisers Suffolk and Norfolk each made visual contact with the enemy. Norfolk was spotted and came under accurate fire from Bismarck, necessitating her withdrawal to a safer shadowing position. This contact was quickly communicated to Hood which was then some 300 miles distant. With Norfolk’s report there was a perceptible change of mood in the battlecruiser as she increased speed and adjusted her course to intercept the enemy. At midnight on 23 May, Hood’s ship’s company closed up at action stations where they waited patiently until 05:35 the next morning when the two enemy ships were spotted. The two forces were closing rapidly on each other and at 05:52 Hood opened fire at a range of 25,000 yards. The Germans were quick to reply, straddling Hood with their opening salvos. Moments later the battlecruiser was hit on her boat deck causing a fire to erupt amongst her ready use ammunition. At 05:55 Hood signalled an alteration of course to Prince of Wales in order to bring their aft turrets to bear. This was followed by a second manoeuvring signal at 06:00 at which time Bismarck’s fifth salvo struck Hood behind her mainmast causing a catastrophic magazine detonation and breaking the ship in two. With her bow pointing skyward and her after part shrouded in dense smoke, the pride of the Royal Navy was no more. Minutes later she had disappeared altogether leaving only three members of her ship’s company clinging to life in the icy North Atlantic waters. 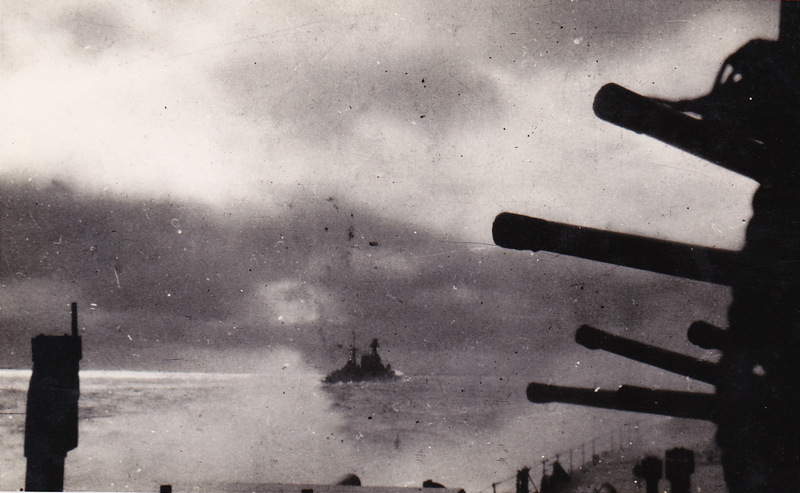 One of the last photographs taken of Hood from her consort HMS Prince of Wales, 24 May 1941. With Hood vanquished the German ships turned their attention to the Prince of Wales which was hit repeatedly and forced to retire from the action behind a smoke screen. Although victorious, Bismarck had not escaped unscathed. She had received two severe hits. One had pierced a fuel tank leaving a tell tale trail of oil in her wake, while the other had caused flooding in her bows. Notwithstanding this damage she was still able to make good 28 knots as she and her consort steamed steadily south. The loss of Hood, with 1415 of her crew, stunned the English speaking world and sent a shockwave throughout the Royal Navy. In the days that followed every resource available to the Admiralty, including the Australian destroyer HMAS Nestor, was committed to the hunt for the Bismarck which, having successfully detached Prinz Eugen during the evening of 24 May, was steaming independently for Brest to carry out repairs. Over the next two days Bismarck was hounded by a navy intent on revenge. On the evening of 26 May she was crippled by torpedo bombers from HMS Ark Royal and with her steering gear jammed and speed reduced it became obvious to Lütjens that it was only a matter of time before the battleships of the British home fleet would overhaul her and close in for the kill. Bismarck’s end came on the morning of 27 May when the battleships HMS Rodney and HMS King George V were directed to the stricken battleship by the Norfolk. At 08:47 they opened fire and by 10:15 Bismarck had been reduced to a blazing wreck. Scuttling charges were fired by her crew and a torpedo attack from the cruiser Dorsetshire delivered the coup de grace, causing Bismarck to heel over and sink at 10:40. In 2001 Hood’s wreck was discovered by renowned shipwreck investigator David Mearns. A commemorative plaque was placed on it recording the names of all who were lost in her. Among these were the names of John Shannon, Ian Startup, George Hall and David Hall, four of the young Australian yachtsmen who answered Britain’s call in her hour of need. ↑ A naval and military term used to describe parade ground training and marching. ↑ RG Robertson, 'HMS Hood/Battle-Cruiser 1916-1941', in 'Warships in Profile', Vol. 2, Profile Publications, Windsor, Berkshire, 1973. ↑ Naval Staff History, 'Second World War, battle summary no. 5: the chase and sinking of the Bismarck', Admiralty, London, 1948, p.1. ↑ Naval Staff History, 'Second World War, battle summary no. 5', p. 2. ↑ Alan Coles and Ted Briggs, 'Flagship Hood, the fate of Britain’s mightiest warship', Robert Hale, London, 1996, p. 199. 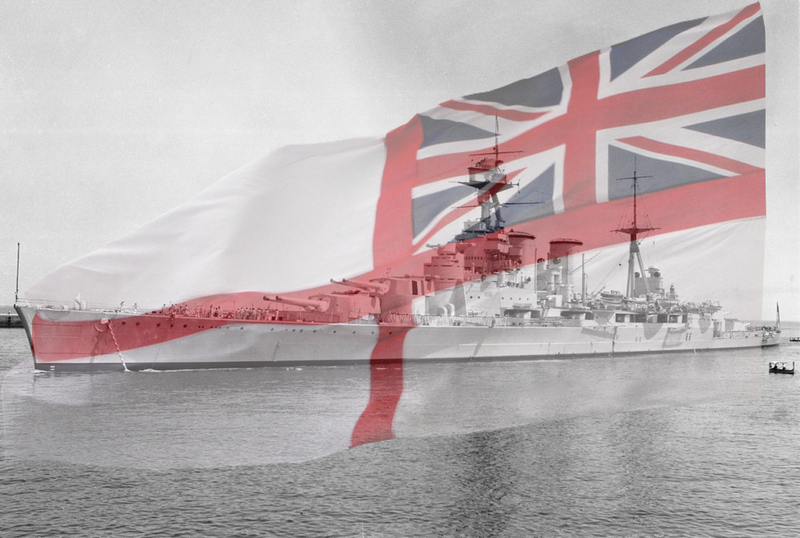 ↑ Coles and Briggs, 'Flagship Hood, the fate of Britain’s mightiest warship', pp. 204-5.